I have run many trainings for different organisations. They include ‘Art-making as a Useful Approach’ for health professionals; ‘Art for Stress-release and Self-regulation’ for Corporate clients; ‘Art Stimulates Creativity’ for organisations; ‘Group Art Process’ for Team Building; ‘Using Art in therapy’ for psychotherapists and more. Every workshop is tailored towards the needs of the organisation as well as the client group they are working with. 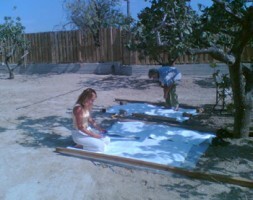 Art therapy training is a two or three year Masters degree and clearly any training days/weeks are not an art therapy training per se. However many counsellors and therapists are seeing the benefits of image-making with clients and would like some guidelines about the practice. Other allied health professionals would like to add to their therapeutic tool kits and want to learn basic principles. Hence art therapy history, making images, learning about symbolism and interpretation, improving visual literacy, developing versatility and confidence with a variety of art materials can all be part of the training mix. 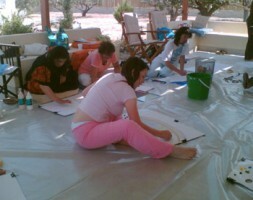 As a trained educator I enjoy creating an art therapy training programmes for personal and professional development. Centre for Counselling and Psychotherapy Education – visiting tutor to run the Creative Weekends for first year students as well as the MA in Family and Child Therapy. 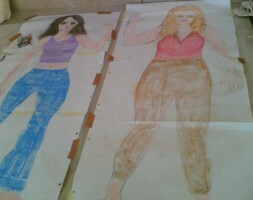 Hospital of St. John and St. Elizabeth - Introduction to Art Therapy for Midwives and Post-natal group. James Wigg GP Practice – Presentation on Art Therapy and Mental Health for medical team and practice management. London Borough of Bromley - A six week programme (2 hours per week) for cross-curriculum teachers from primary and secondary schools in the borough. 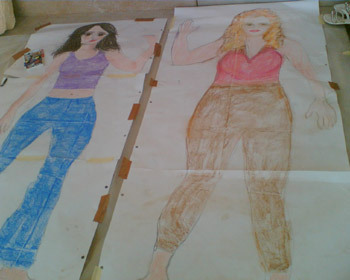 The programme focussed on how images made in lessons can be used to engender social skills, increased respect, personal reflection, communication and self-expression. 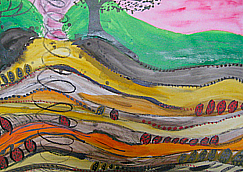 NHS GP Practice in East London – lunchtime CPD meeting on art therapy. Training for Homeopaths (in UK, Germany, India, Japan) - Homeopaths have shown an interest in art therapy for a number of years. Homeopaths are not trained to use image-making with clients however they find it a useful way to develop a conversation with their patients in order to identify or exclude possible remedies. 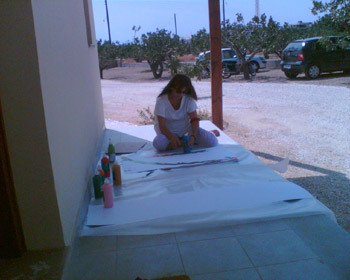 I was invited to present art therapy at various International Conferences for homeopaths. 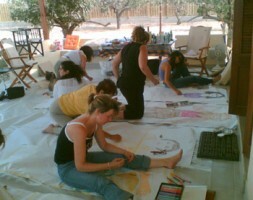 Ubelele Psychotherapy Centre, South Africa – Visiting tutor for art therapists. One Day training. University College Hospital - Three hour workshop for medical students about to embark on charitable work in a special needs centre in rural Ghana. University of Surrey – Presentation on art therapy to PhD. Psychology Department students. In 2006 I was invited by Dr. Panos Asimakis to run a 5-day training for the Synthesis Psychotherapy Training School in Greece. What I found particularly interesting was working with and through a translator. As a picture can say a thousand words, the translator also has to convey a sense of the unspoken, while being accurate as to what is being expressed in words. 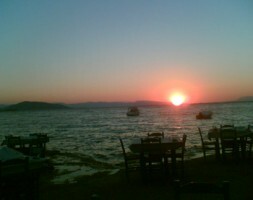 This happens through timing, intonation, sensitivity and care, which Yianna the translator excelled in. The school had recently moved to new premises and we needed to use the outside space for the body map exercises which I introduced on Day 4. 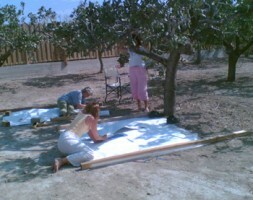 The 16 trainee therapists were able to spread out into the newly planted orchard and paint in the gusty wind. When we were looking at the images and discussing the themes that emerged, I was most touched by one of the students whose image was so unclear it could not be photographed, and to look at it was like looking at something partly formed and yet recognisably a body. 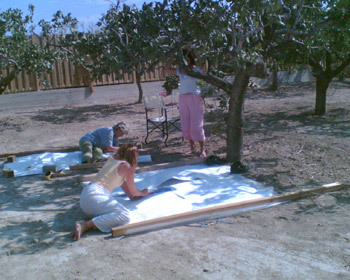 When I asked the therapist how she had made her image, she described how instead of lying down on the paper, she had invited a partner to draw around the shadow of her body while she stood up, the shadow made by the sun and the wind gushing through the trees. The image, painted by the translator, had unclear and open boundaries and we reflected on her role in having all the words of others pass through her. The discussion of the shadow image, with all its associations could have gone on for days. 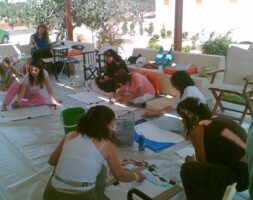 Please click HERE to sign up for Art for the Heart Workshops Updates, and other news.